The working of Celsius and Fahrenheit scale digital thermometer using AT89C51 simple based on the concept of heat energy change into the voltage form this voltage future change into the digital signal this signal are provided the controller unit . the controller unit is simple combination of controller 89C51 and oscillator circuit which is produce the 11.0592 MHZ frequency for timing circuit the output of the controller are connected into the LCD display the programming of controller is implemented into embedded c language platform by used the burner .this programming are change the output in two scale that is Celsius and Fahrenheit scale with digital output. Celsius scale thermometer displays the ambient temperature through a LCD display. It consists of two sections. One is that which senses the temperature. This is a temperature sensor LM 35. The other section converts the temperature value into a suitable number in Celsius scale which is done by the ADC0804. 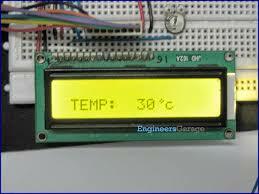 A digital thermometer can be easily made by interfacing a temperature sensor to the microcontroller AT89C51. The temperature sensor used in the project isLM35. The LM 35 IC generates a 10mV variation to its output voltage for every degree Celsius change in temperature. The Output of the temperature sensor is analog in nature so we need an analog to digital convertor for converting the analog input to its equivalent binary output.ADC 0804 is an analog to digital convertor IC used in the project. 0804 is a single channel convertor which converts the analog input up to a range of 5V to an equivalent 8-bit binary output. A digital thermometer can be easily made by interfacing a temperature sensor to the microcontroller AT89C51. The temperature sensor used in the project is LM35. The LM 35 IC generates a 10mV variation to its output voltage for every degree Celsius change in temperature. The Output of the temperature sensor is analog in nature so we need an analog to digital convertor for converting the analog input to its equivalent binary output. The implementation of Celsius and fahrenheit scale digital thermometer is done successfully. The communication is properly done without any interference between different modules in the design. 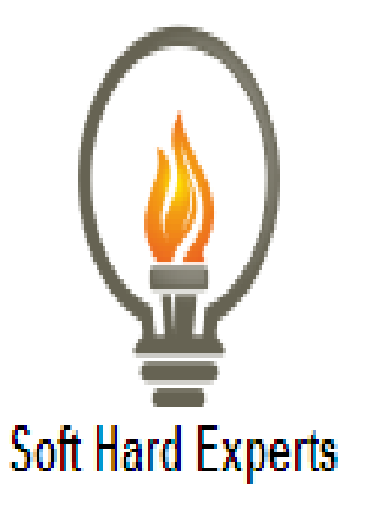 Design is done to meet all the specifications and requirements. 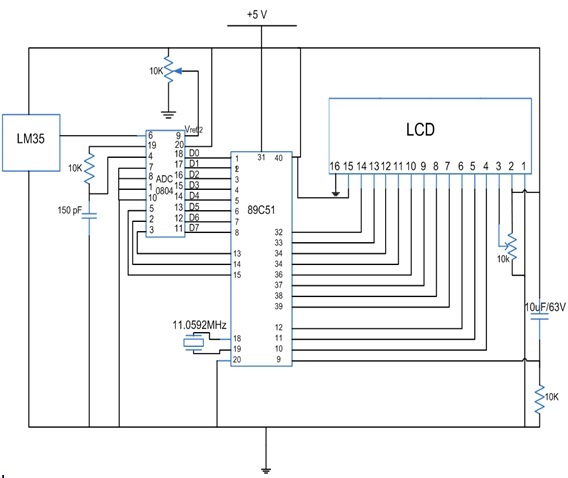 Software tools like Keil Uvision Simulator, Pro load to dump the source code into the microcontroller, Orcad Lite for the schematic diagram have been used to develop the software code before realizing the hardware.